Arkansas has a rich history in support of our nation’s front line defenders of freedom wherever that mission has taken us. Whether it is measured in the lives of our men and women who have served on active duty in harms way or providing the resources that our country needs to wage effective peacekeeping or the materials for fighting wars when necessary Arkansas has always stepped up. 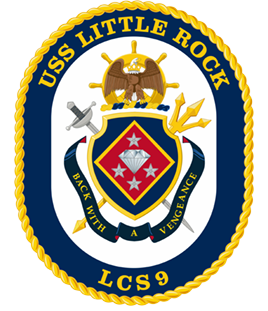 In accordance with that dedication, later this year the United States Navy will commission the newest ship to be accepted into the fleet, the USS Little Rock (LCS-9), in a ceremony at Buffalo, New York. It will take place alongside the original USS Little Rock, now serving as a museum ship permanently docked in Buffalo. We believe this will be a first in Naval history. It is a high honor that our Navy has bestowed on the City of Little Rock, and Arkansas. With that honor comes some responsibilities that a committee of interested citizens in the Greater Little Rock area has been working for several months to accomplish. We call it the USS Little Rock Namesake Committee. We stand ready to work with the Ship’s crew, the U. S. Navy, the Buffalo, New York Commissioning Committee and the citizens of Greater Little Rock to make Commissioning Week an historic and momentous event. As Chairman of the USS Little Rock Namesake Committee, I encourage everyone to monitor this website for updates on Commissioning Week activities and to support the crew of the ship as this historic occasion unfolds. I, and everyone else in the City of Little Rock and the State of Arkansas, are deeply honored by the naming of this Ship for our capital city. Our civic pride and enthusiasm will shine brightly as we work to make this event one of the best our country has ever seen!